Here we go again with the royal baby bump watch. 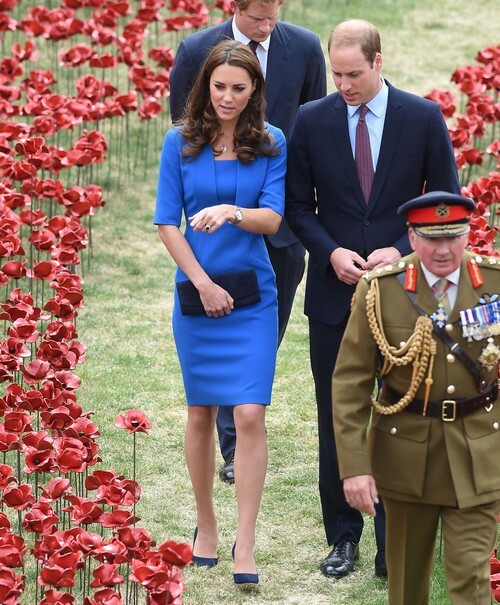 A pregnant looking Kate Middleton joined Prince William and Prince Harry earlier today at the Tower of London for the Ceramic Poppy Field of Remembrance ceremony and she wasn’t exactly looking her best. Kate is usually pretty radiant and instead photos from the event show The Duchess of Cambridge as put together but looking a little bit gray, as if she has morning sickness with a second child pregnancy. That is leading to rampant rumors that Kate is once again knee-deep in the throes of morning sickness. Of course we still have to deal with miscarriage rumors which the palace has neither confirmed nor denied as is their habit. It seems that all royal watchers have kept their eyes focused on Kate’s midsection for months now, hoping to see proof that baby number two might be on its’ way. In these photos Kate has a small waist line but she has her clutch bag strategically placed over her lower stomach for the entire event. Her right arm doesn’t move from in front of her body, leading us to question what exactly she is hiding. No one keeps a body part perfectly still, unless they have a reason to. Kate’s reason might very well be that she was subconsciously protecting her baby bump while inadvertently calling attention to it! What do you guys think? Is baby number two really on its’ way or is it just another false alarm? Does Kate look like her usual self here or does she look a bit sick to you? Kate and William have said that they’d like 3 children within 5 years and if that time frame is still accurate then baby number two can’t be too far off, right? Is Kate really pregnant again or do you think that royal watchers are just looking too closely and believing that they are seeing what they most want to- proof of another royal heir? Tell us your thoughts in the comments below! Kate Middleton Baby Countdown – How The Duchess Is Preparing For Royal Baby! Kate Middleton Baby Due Soon, Queen Elizabeth Wants It Before She Leaves For Vacation! Kate Middleton’s Hair The Most Famous Hair In The World – It Has become Its Own Celebrity!